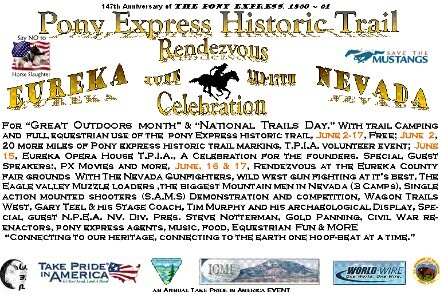 June 15: Eureka Opera House, Clint Eastwood's Nevada Public Service Announcements open the Take Pride in America Celebration honoring the Pony Express founders, Russell, Majors & Waddell, and their legacy. Chris Cook, B.L.M. Archaeologist on "How to be a Historical Site Steward;"
Showing of Filmmaker Hal McClure's "Echo of Hoofbeats, The Pony Express Story." Music at Eureka's legendary Owl Club with the 'Rendezvous band' after the Opera House Celebration. Single Action Mounted Shooters (S.A.M.S) Demonstration, dusk Saturday; competition, Sunday. In the sport of Cowboy Mounted Shooting, contestants wear period 1890's clothing and use 2 single action .45 caliber revolvers loaded with 5 blanks each. A rider negotiates a course with 10 balloon targets. The Rider shoots the balloons with the blanks, and is scored on time and accuracy. Membership drive for the Eureka County Fair shoot-off competition in August. The Eagle Valley Muzzle loaders, the biggest Mountain men in Nevada (3 Camps), take you back in time when trappers, miners, and fur traders roamed the area. See competition in events including Black Powder Shooting, Tomahawks and more with everyone in time-period clothing. and ride in Gary Teel's Stage Coach (but, caution: There's gun-slingers in the area and the stage coach has been known to be held-up!). But don't worry, the Nevada Civil War re-enactors will be there to keep order in this crew of wild west characters. Special guest, National Pony Express Association NV. Div. Pres., Captain Steve Notterman of the Eureka Night-Riders (The 2007 Pony Express Re-Ride will traverse the PX trail through Eureka County June 18th). Gold Panning, music, food and Equestrian Fun & MORE! Dedication of National Park Service Pony Express historical kiosk site (date to be announced). W.B.N. Will Encourage Local Particicpation in the Interpretation, Development, and Protection of the Pony Express National Historic Trail. W.B.N. Will Increase Public Awareness and Use of the Pony Express National Historic Trail and Expand Support for its Complete Development.